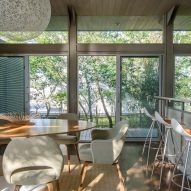 Rodman Paul Architects has overhauled a single-storey home on New York's Fire Island, opening up views from the living space to the swimming pool and bay beyond. The property is located at 248 Bay Walk in Fire Island Pines – one of several communities dotted along the barrier island, which is accessible from the city via train or car, then a ferry from Long Island. New York City studio Rodman Paul Architects oversaw the renovation of the modern-style house, which faces the Great South Bay, in order to make the most of the waterside site. Accessed past a gate via a wooden boardwalk, sliding doors opens into the central kitchen and dining room, which connects two perpendicular volumes at the front and back of the site. Retractable glazing opposite the entrance opens on to a secluded decked patio, linking to the main outdoor area past an exterior shower. From the kitchen island, more sliding glass doors straight ahead are aligned with the outdoor swimming pool, which stretches towards the bay. 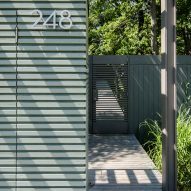 Units wrapped in wooden slats flank the corridor, and contain bathroom and storage facilities. "The renovation opens the central core of the house to create a long view through the main living spaces to the bay beyond," said a project description. "Two pods, which contain secondary spaces, serve as a gate framing the view to the water but keep the open plan from feeling overly exposed." The lounge is positioned to one side of this main axis, while the master bedroom on the other side is separated by a partition. Both of these rooms also provide direct access to the spacious wooden deck, where an alfresco dining area, sun loungers and a hot tub can also be enjoyed. 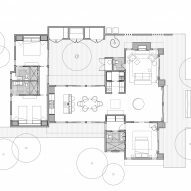 Towards the front of the plot, on the other side of the kitchen, is the second volume that accommodates two more bedrooms – each with an ensuite. Across the building, clerestory windows were added between the doors and the roof to bring more light into the residence. "The form of the roof plane was exposed and separated from the interior walls to accentuate the feeling that the roof is floating above you," said Rodman Paul Architects. Decor chosen by Mark Schryver is simple and neutral, but interspersed with bright orange details both inside and out. Since the mid-20th century, The Pines has provided a haven for New York's gay community, who escape to the carless beach spot to stay in vacation houses during the summer months. The area boasts a significant collection of modernist architecture, built predominantly from timber upon the shifting dunes. Contemporary additions include the Pavilion nightclub by HWKN, constructed in 2013 to replace an older structure destroyed by a fire. Photography is by Michael Fasulo.